update: Thank you for the responses but all books are now gone! 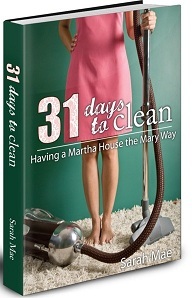 Sarah Mae has been so gracious as to give me not one, not two, but three copies of 31 Days To Clean to giveaway here for my readers. I'm going to make it as simple as I can for myself and you. First, to be eligible you must follow my blog. If you already do - awesome. If you don't, just click the follow button on the sidebar. Second, email me at smjlangley@gmail.com. That's it - the first three emails of followers that I receive get the book!